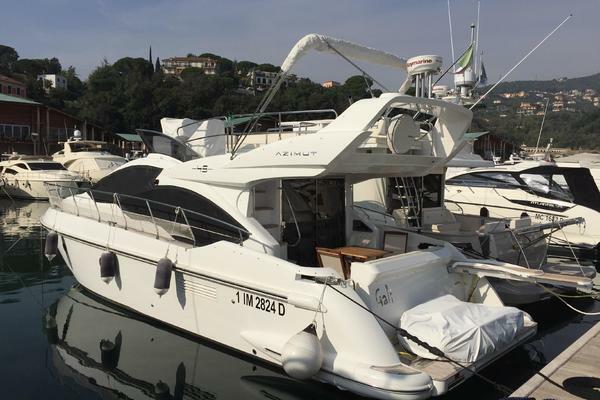 United Yacht Sales New Jersey would love to guide you through a personal showing of this 55' Azimut 55s 2016. 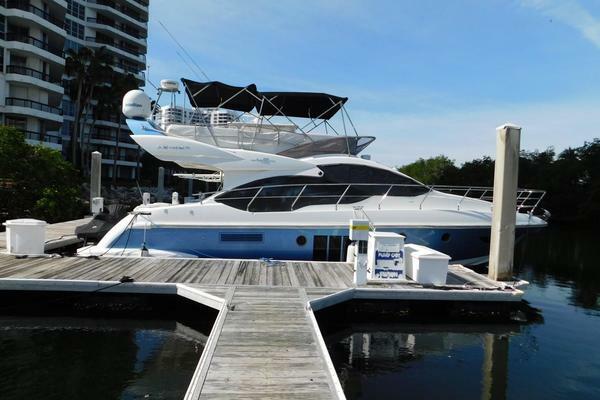 This yacht for sale is located in Fort Lauderdale, Florida and priced at $1,295,000. For a showing please contact us by filling out the form on this page and we will get back to you shortly! Hull ColorUrals Grey Metallic DimensionsLOA: 56 ft 9 inBeam: 15 ft 7 inMaximum Draft: 4 ft 3 in EnginesTotal Power: 1305 HP GeneratorGenerator Brand: Kohler Generator Rating: KWGenerator Hours: 175 TanksFresh Water Tanks: 155 GallonsFuel Tanks: 422 GallonsHolding Tanks: 46 Gallons AccommodationsNumber of twin berths: 2Number of double berths: 2Number of heads: 3 / 1Crew quarters: 1 Salon / Dinette • Leather Salon C-shaped sofa • Port Side Hi-Lo adjustable dinette / forward seating with built in chaise lounge• Chilled water air conditioning controls• Expansive Dinette w/ seating for 6• Triple Stainless Steel Sliding Salon Door• Overhead lighting w/ Dimmers• UPGRADE: Wood flooring • UPGRADE: Port Side Hi-Lo adjustable dinette / forward seating with built in chaise lounge (described above)• UPGRADE: Hi-Lo / Swivel LED TV• UPGRADE: Bose Lifestyle Surround Sound• UPGRADE: Samsung Bluray DVD• UPGRADE: Sat TV controller w/ UPS back up Galley • Stainless steel sink with single lever faucet• Hinged & Folding Galley counters• Stainless Steel counter tops• Under counter refrigerator• Under counter galley freezer• 4 Burner Stove (Miele Upgrade)• Built-in dish and drawer storage• Flatware, Stemware, Dishes for a seating of 8• Slide out Garbage bins• GFI receptacle w/ additional sockets• Wood floors• UPGRADE: Miele appliances• UPGRADE: Miele Microwave / Oven Master Stateroom • Angled oversized master berth• Built in Vanity Table with seating on both sides• Chilled water air conditioning controls• Large Rectangular Picture windows• Opening windows (2 per side) w/ venetian blinds• Decorative stability hand rails• Full size wardrobe hanging locker with hinged full length mirror• Standup built in closet• Overhead lighting• Reading lights• Storage compartments• UPGRADE: Hardwood Flooring• UPGRADE: Safe in Master• UPGRADE: Bidet feature on TECMA toilet• UPGRADE: Samsung LED TV• UPGRADE: Samsung Bluray DVD• UPGRADE: Sat TV controller w/ UPS back up Master Stateroom Head • Molded fiberglass shower with grated wood floors, bench seat & glass doors• Tecma head• Cognac glass sink bowl with single lever faucet• Wood floors• GFI receptacle• Overhead lighting• Air Extraction Fan• Opening porthole window with venetian blinds• Cabinet storage, Towel holder• Mirrored vanity with lower storage drawer VIP Stateroom • Center lined island queen berth• Panoramic Bow Picture windows• Opening windows (1 per side) w/ venetian blinds• Full length lockers to starboard and port sides• Overhead Horizontal cabinet storage to port and starboard• Overhead private escape hatch with opening port and screen• Chilled water air conditioning controls• Overhead lighting• Carpeting• Reading lights• UPGRADE: Hardwood Flooring• UPGRADE: Samsung LED TV• UPGRADE: Samsung Bluray DVD• UPGRADE: Sat TV controller w/ UPS back up Guest / Day Head • Full stand-up shower with full size glass entry door• Tecma head • Cognac glass sink bowl with single lever faucet• Vanity with lower drawer storage• Wood floors• GFI receptacle• Overhead lighting• Air Extraction Fan• Storage Cabinets, Towel holder• Opening Porthole window w/ venetian blinds Guest Stateroom • Side by side twin berths• Chilled water air conditioning controls• Opening Porthole window w/ venetian blinds• Oversized stand-up closet/hanging locker• Carpeting• Reading lights• 12V receptacle• UPGRADE: Hardwood Flooring• UPGRADE: Samsung LED TV• UPGRADE: Samsung Bluray DVD• UPGRADE: Sat TV controller w/ UPS back up Helm • Azimut systems monitor digital switching interface• IPS Joystick Docking for control of Engines• Bow Thruster• RayMarine Platinum Package Includes:• (2) RayMarine GS 165 Displays (Radar/Fishfinder/Plotter)• RayMarine Open Array 4KW Digital Radar• RayMarine P 70 R Auto pilot• RayMarine I 70 multifunction unit• RayMarine 260 VHF radio• RayMarine Video cameras• SeaKeeper Gyro control • Azimut trim tab controller• Leather helm seat electrically adjusted height & depth• Starboard electric window • Compass• Gauges: Volvo• Tilt wheel• Overhead lighting• Fire suppression override control• Windshield wiper controls• UPGRADE: Bow Thruster• UPGRADE: RayMarine Platinum Package (described above)• UPGRADE: RayMarine AIS 650 (described above)• UPGRADE: Raymarine Video cameras (described above)• UPGRADE: Co-pilot seat finished in Leather Cockpit • Central Seating for 8 w/ Teak Dinette Table• Entertainment Center: Sink, Kenyon BBQ, Ice Maker• Overhead & Courtesy lighting• Rail package• Covers for the seating• UPGRADE: Entertainment Center: Sink, Kenyon BBQ, Ice Maker• UPGRADE: Teak Side Decks • UPGRADE: Hi-Lo Cockpit Table• UPGRADE: Sunbathing cushion insert• UPGRADE: Stereo System w Speakers• UPGRADE: To Floodlights installed on aft Flybridge Hull / Deck • Painted Hull sides in Urals Grey Metallic• Teak Cockpit & Swim platform Decks w/ upgraded teak side decks• Compressed Air Ship’s horns• “C” shaped cockpit seating w/ upgraded HI-LO Teak Table • (3) Opacmare glass entry doors with stainless steel frames• Port and starboard side boarding doors• Recessed lighting and speakers in the aft deck overhang• Port and starboard aft boarding gates to the transom• Protective Covers for cockpit seating & table• Exterior black mesh snap on window sunshades• Bow Sunbathing Cushions w cover • Lockers and storage compartments• Rail package• Stainless Steel rub rail• Battery on/off switches on aft deck• Manual fire pull over-ride pin on aft deck• Whale manual bilge pump• Fresh water transom shower• Dockside water connection• Engine room access door in aft deck floor • UPGRADE: Painted Hull• UPGRADE: Twin Pedestal Teak Table• UPGRADE: Electric winches• UPGRADE: Teak Side Decks Crew Quarters • Single berth• Chilled water air conditioning controls• Crew head/shower• TECMA toilet Mechanical • Triple VOLVO IPS diesel engines• Bilge pumps• Emergency bilge water discharge through engines• Bilge air induction system• Bow thruster• CruiseAir chilled water air conditioning system• Dual Racor fuel filters• Twin Disc 2:1 gears• Lofrans windlass with all chain (75M), foot pedals, SS chute, and Delta anchor• Seakeeper Gyro Stabilizers• UPGRADE: SeaKeeper Gyro Stabilizer w/ larger generator• UPGRADE: Glendinning Cable Master• UPGRADE: Central Vacuum• UPGRADE: Chain Washing system Electrical • 60 Cycle Service• (2) 50amp shore power cords on electric reels• CATV/phone hookup• Battery on/off switches• Ship’s batteries Tender • Yachtique Williams 285 TurboJet Exclusions OWNERS PERSONAL ITEMS OR ANY OTHER ITEM NOT LISTED HEREIN AT TIME OF VIEWING.